Tim: I ended up in England on my way to travel in Europe. Landed in London and walked up through Hyde Park and this crazy parallel skater came by and when he saw my new Powell-Bones double conicals he slid to a stop and introduced himself as Steve Kane with skateboard magazine (London). After seeing my rollerskates he gave me directions to the magazine office and when they had photographed my new equipment for write ups in the mag they took me to this bowl to see if I could skate. Mind you this bowl was 12' deep with 4' of vert, had a 6' deep entry bowl and 3' roll-in bowl, very hard to skate the entry, it was so tight. I caught air and soon after was doing inverts. Tim: My favorite move, ever. This pic was taken when we met in Cologne. 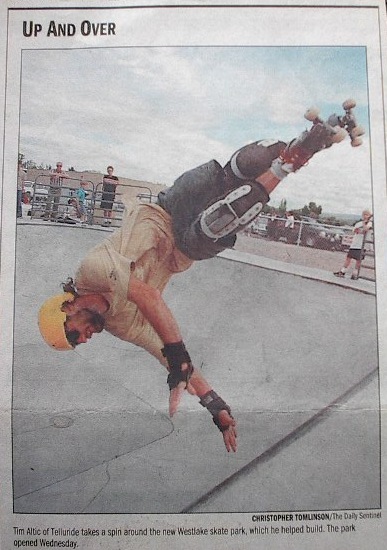 "Tim Altic of Telluride takes a spin around the new Westlake skate park, which he helped build." Tim does a Bert Slide under Gerry's air. How long have you been rollerskating? I was conceived after my parents went dance roller skating most likely. And I have a re-occuring dream of my dad holding me as a baby and I can remember the light reflecting off the wood floored rink with a distinct corrugated effect from the wood warping from moisture, just like the old gym floors do. I grew up roller skating and then started skate boarding in 1975. My brother bought a board and the 3rd run down the hill I was followed by my friend in a car and clocked at 30 mph. I then talked one of the kids into selling me his board. I learned how to skate board from this beautiful little girl from Pasadena CA, of all places in Montana, in a gymnasium. 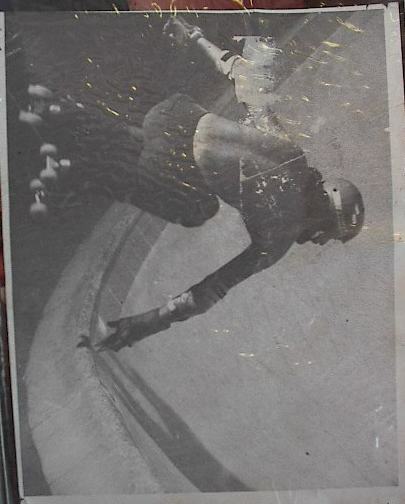 After a winter of practicing wheelies, spins and end overs, I got more into it and in college used my grant money to buy a partnership in The Smoothhill Skate Board Shop in Santa Rosa, Ca. I had a shop team and we were sponsored by Rector safety equip. co. and I hosted competitions to promote skating for my shop. 1977 was a drought year and [people were not allowed to fill the pools so] the shop did well. One day I looked out of the window of the shop and this guy was roller skating past on out door skates, so I followed him to the college and he was lucky he brought his shoes with him. I bought his skates off him right then and there. I sold my interest in the skate shop and went to Europe via London, England. That is when I turned pro. And that's a whole story in itself. When and how did you start vert rollerskating? I started vert skating the day after I bought the outdoor skates. 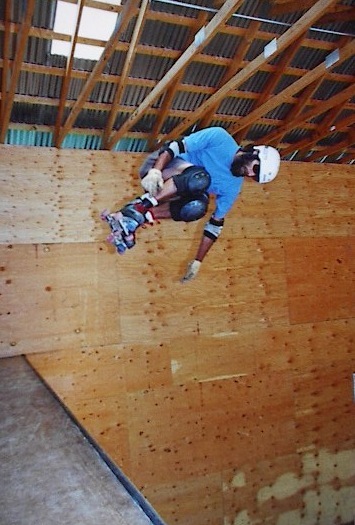 We had a very nice little skate park near Santa Rosa, and I was always there boarding, and that is when Tony Alva was catching air, I was afraid to pull airs but when I got my roller skates out, I caught air the first time I dropped in the vert bowl, I was ecstatic and haven't stopped catching air since. Which moves did you pioneer? 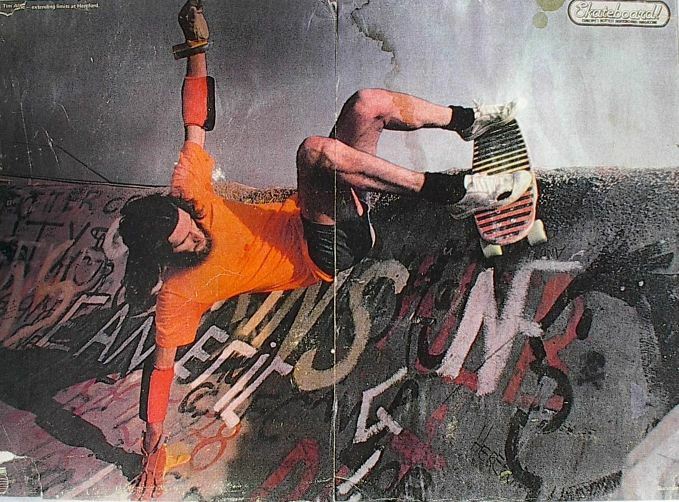 I was most inspired by Jay Adams and that old black and white pic in the magazine of him with his hand down, grabbing that old fiberglass Z-products, Jay Adams Model. I'm sure you have seen the picture yourself. And when I went to Europe I was all of a sudden expected to pull off all the moves that were in the mag. 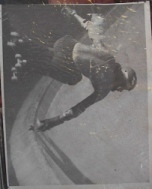 I started pulling inverts in the spring of 78. I was doing 540's on vert and created many new stalls and slides. I am a very surf styled skater and most of my moves had a hand down, or were in the air, that is methods and grabs. How did your pro career start? I became a pro instantly on my arrival in London. This is a story in itself, but I ran into the magazine test team in Hyde Park and they asked me if I caught air on vert. I said, yes, that's why I skate vert. 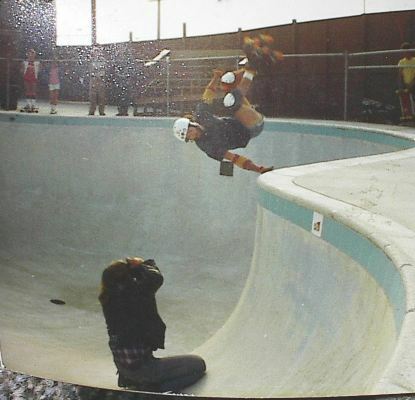 They took me to The Mad Dog Bowl; a 12' deep pool with tile and coping and let me have at it. I signed 45 autographs that night. I also traveled to do demos in Holland, France and Germany. The scene was just like now, in that we (all skaters) were trying to learn and experience skating as a fun means of transportation. The scene was what we fed off of, such as now. We sessioned together and shared that energy to drive us (each individual) to a higher level than we could experience by ourselves. It is so much fun to skate in a hot session, no matter who it is, or what tricks are being done. I know that what is being done (tricks) now, is going to be seen as a period of evolution in the sport. We each need to realize that creativity is the motivating factor. What's the craziest experience during your life as a pro rollerskater? I came back to the US after touring Europe and England and I went straight to the Marina Del Rey skate park. I told them at the front desk that I had just flown in from Europe and that I had been a pro there and they let me skate free. And then I went out and put my stuff on and skated. Denise the owner came out and asked me if I was planning on being in the MDR Dog Bowl Pro. He then sponsored me and gave me all new stuff out of the pro shop inside, and I went to look for a place to live in Venice, only 3 miles away from the park. I skated in the contest and placed 3rd in the world. There were a lot of things happening to me during the 3 years that I skated pro. None of it was important or great, as it is when I look back on it now. I was engrossed in living what is now history, now let's hear your story. I mean that each person's story is very important to me if we are spending time together. I think of skating with you in Germany and then meeting you again because of common friends and having you interview me as a part of history. You are the one who finally found Percy and opened the door to history. Making the documentary "Tim, Rollerskater" [tr] was the most concentrated excitement during my stay in Venice Beach and that after traveling in Europe, meeting all the people that the movie inspired, has been the most gratifying experience in my whole life. What was the whole Skateboard Madness thing like? Once again, great things back then were like good skate sessions. 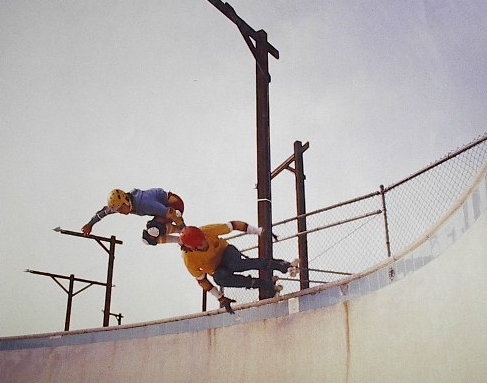 I remember having a great time skating with the likes of "Polar Bear" Denise Agnew and Shogo and Jerry Valdez and all the pros that came to Marina skate park because it was so good. I skated with all of them but I'm bad at remembering names. I also loved skating with Duke Rennie [dr] (a roller skater) because he was so smooth and the fastest thing on wheels. He was so much smoother and faster than anyone else, and I watched him do stuff like, 2 consecutive revolutions in the turning point ramp, and front side air 12 coping blocks long (that's a long way). Remember that was 1979! Which competitions did you enjoy most? They are the most gruesome emotional tortures that I could imagine and that at the moment of my run is the only time that I feel elated or excited. I remember being depressed and fragmented for weeks before the Winchester Pro Bowl and that on the morning of the comp I woke up clear and excited. I saw some very funny things there at Winchester that made me relax and feel sure of myself. The funniest thing was, a bunch of the skate board pros all got together and put on these demo-pool riding rollerskates that Variflex was trying to promote vert skating with and they all skated parallel like me because sidestance is hard at first. They were in this 2' deep mini pool w/coping and they were pulling off all the tricks that we rollerskaters were doing and laughing at how easy it was to rollerskate. 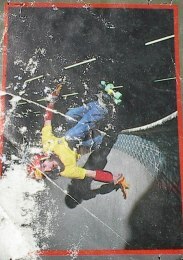 That was the competition that Greg O'Neil, a skater for Variflex, skated both parallel and sidestance in a pro contest. I recognize him for diversifying extreme rollerskating. What's the history of vert rollerskating? Kenny Means to me is the history of vert rollerskating. I knew of no other, but when I got to LA I found out that he had a brother and that they were surf rollerskaters. That is what inspired me in the beginning and at Marine Dog Bowl Pro I placed 3rd and Kenny Placed 4th. I wasn't proud that I had beaten him because I had looked at him as my mentor and yet I see that as the most common path of seeking betterment. Did you have major injuries? I had many skinned knees and hips but the only bone I broke was my index finger. I fell from hitting a stone just skating down the side walk. Yes I avidly skate whenever I can find a good skate park, in big cities I skate on the street but I like very expensive architecture so I only skate in very big cities. How do you stay so fit? I didn't know I was still fit, I am skinny but I no longer try to be fit. I blew the cartilage in my knees when snowboarding way back when in a half pipe like feature that Matt Templin and I made out of some snow removal piles from the streets. I missed one of the best powder years in Telluride History. I have since recovered and feel strong from skating bowls and telemark skiing. I'm careful and can still have a lot of fun. I only pull it all out sometimes and rip on superman days only. I wrote something on this [sk], but my current set up is the best skate I've ever had. It is a fusion/combination of all the skates that I could study on a ski trip I made to Switzerland. The whole story is: I telemark ski and like my skates, I made my own tele boots. I was skiing in plastic tele boots 12 years before anyone else. I made them by cutting my plastic hockey boots, adding ski boot cuffs and a plastic sole. 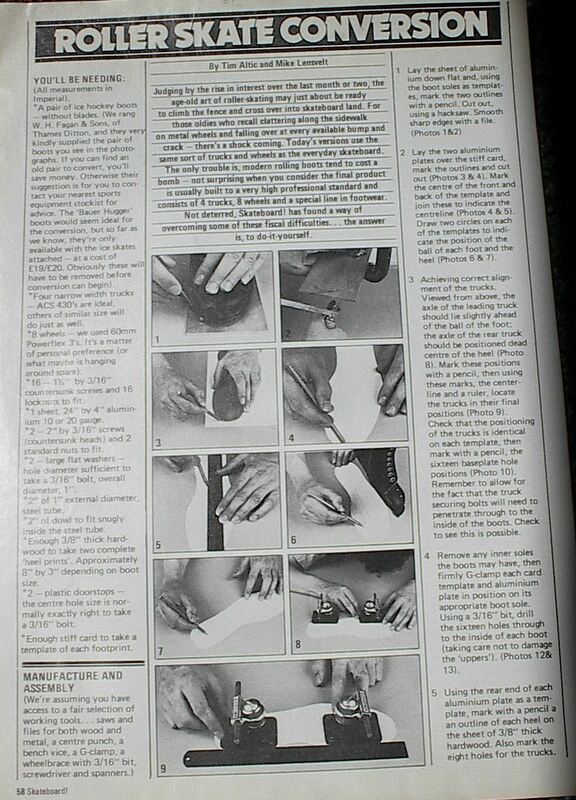 I hoped to meet a ski boot company over in Europe and went to Verbier, with all my equipment. The snow sucked so I took off on the train to Marseille, to skate the new bowl. It had just been built. On the way I had to change trains in Lion and looking for somewhere to eat, I ran into a group of rollerskaters. They took me to these miniramps and there were at least 40 quad skaters there. One of those times that I'm sure I was born in the wrong country. 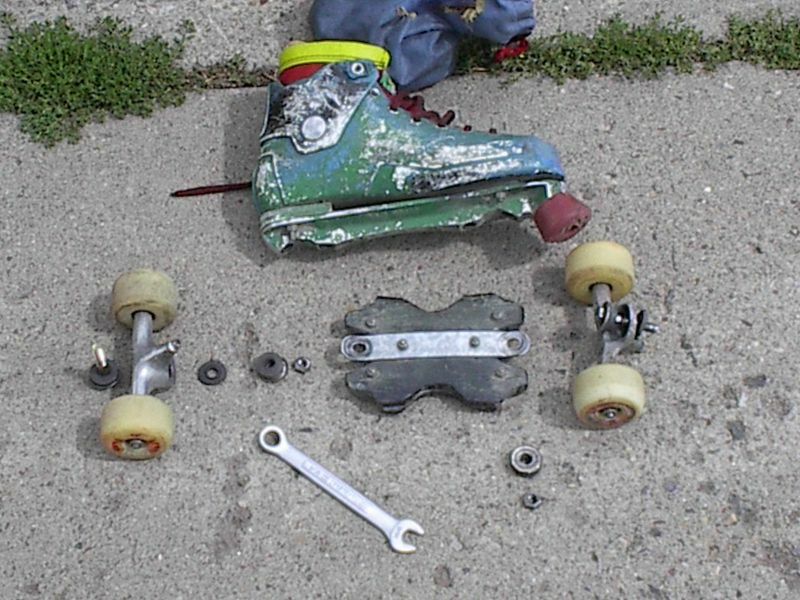 I looked at all their skate set ups and engineered my skates in my mind right then. As soon as I got back from europe I started building this pair. 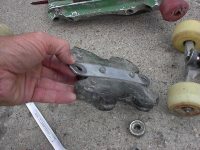 It is: Indy 101's, machined to fit Suregrip Super-X aluminium street plates, with a plastic coping/railslide bolted to a jump bar in between the trucks. The boots are plastic hocky boots cut down. 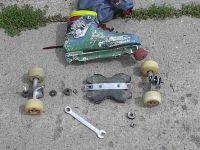 I use any good skate board wheel and have just used up all my old german bearings from when I was pro. My current set up has lasted me 7 years of ripping with hardly a truck adjustment needed. I have another set of everything, so that's probably what I'll be skating for the next few years. I once visited Telluride, and liked it a lot. Nature gave me energy and calmness. Is that a reason why you live up there? You mean do I live in the mountains because of the beauty and the quiet and the river running by and high peaks with snow blowing off the tops or yellow aspens in the fall. I have a beaver living in the river at my front door and a bear that lives up in the canyon behind my cabin. I just found a huge mountain lion skull just a hundred yards up behind the place when I was cutting fire wood. I use a small solar system and kerosene lamps during storm systems that last soooo loong, I guess I'm dreaming now. Because I really like to ski. I like to catch air and that's why I skate or ski. 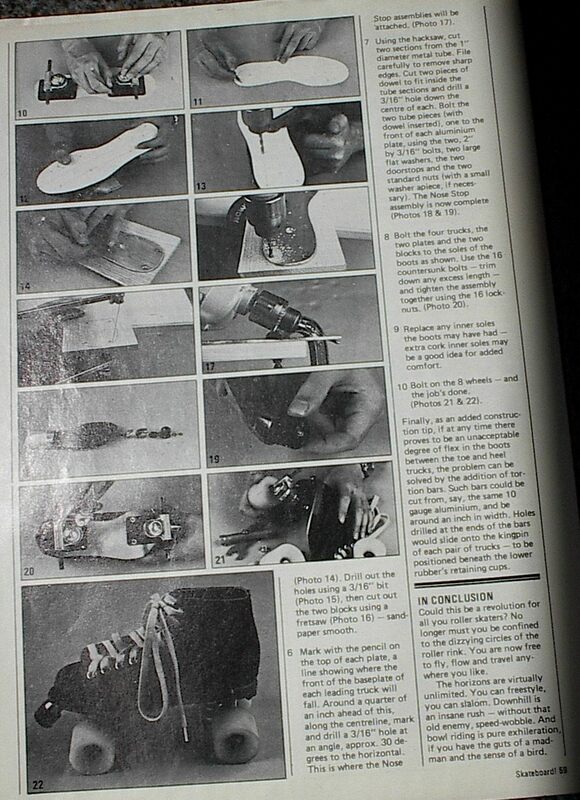 Here's an article called Roller Skate Conversion explaining one way of building rollerskates. JPEGs: page one, page two. HTML version on adinfinitum.de: page one, page two. 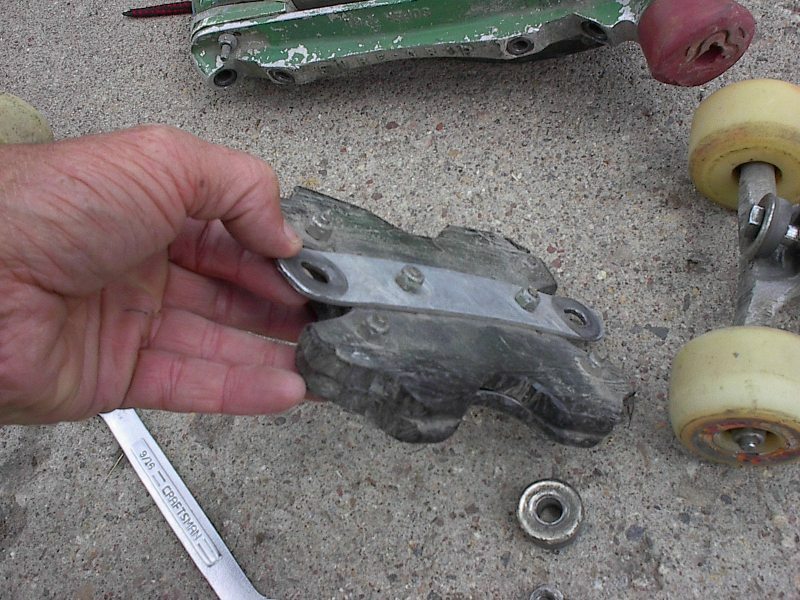 These are the skates described in the interview. "Tim Altic - extending limits at Hereford."